Six months into EEU membership, a Kyrgyz official says it’s too soon to really talk about the impact. Kyrgyzstan completed its accession to the Eurasian Economic Union (EEU) in August 2015, eight months after the union’s official launch and three months after Kyrgyz President Almazbek Atambayev signed the agreements with the leaders of the other member states–Russia, Kazakhstan, Belarus, and Armenia–in Moscow. But as Oleg Pankratov, the deputy prime minister, said at a press conference this week, the results of Kyrgyzstan’s accession to the union–which boasts a single market of 183 million people–are mixed. As reported by 24.kg, Pankratov offered several comments regarding Kyrgyzstan’s decision to join the union and the outcomes so far. “The effect of Kyrgyzstan’s accession to the Eurasian Economic Union turned out to be blurry,” he said. Kyrgyzstan’s accession was originally planned for January 2015 with the union’s launch, but was delayed as Bishkek wrestled with passing the necessary legislation. As Casey Michel wrote in November 2014, it seemed as if Kyrgyzstan was moving reluctantly toward the union. 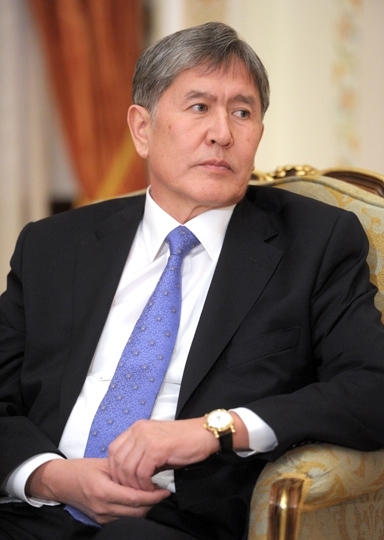 He noted Kyrgyzstan’s leadership had “allowed its distinct lack of enthusiasm slip into its public discourse.” In October 2014, Atambayev said “we are choosing the lesser of two evils. We have no other option.” Better to be inside the union than outside. One motivating factor for the decision to join was Kyrgyzstan’s large population of migrant workers in Russia. If the country remained outside the union, its migrant workers would become subject to stricter rules. The Kyrgyz Deputy Minister of Economy Kylychbek Dzhakypov said recently that over half a million Kyrgyz are presently working in Russia, an increase of 2 percent over the past six months. The actual sum of remittances, however, sent back to Kyrgyzstan has fallen by more than 28 percent, according to the minister. The spin the Kyrgyz authorities are using is that if the country had not joined the union, remittances would have declined even more. The primary purpose of accession, though, was gaining access to markets, Pankratov said. While the technicalities are proving difficult–for example, 24.kg reported that Kyrgyzstan needs $5-6 million to pay for equipment for veterinary laboratories to meet EEU standards–there are no alternatives to the Kazakh and Russian markets for Kyrgyzstan. That said, one of Kyrgyzstan’s major industries is reexporting Chinese goods, a business that is now in a pinch; Kyrgyzstan’s entry into the EEU changes the tariffs importers need to pay and alters the rules for reexporting elsewhere in the region. Meanwhile, cross-border trade with Kazakhstan was supposed to become simpler with the opening of borders, but Kyrgyzstan is still scrambling to meet technical requirements in several areas.